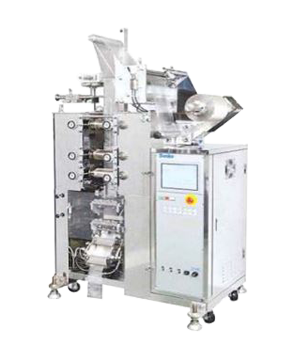 The MR-10 is a liquid and paste filling machine that is highly suitable for diversified small-lot production. In its standard configuration, the MR-10 features a photocell type pattern matching device, film joint detector, film end stop device, a heater for second horizontal sealing roll, I-notching device, and cutter. 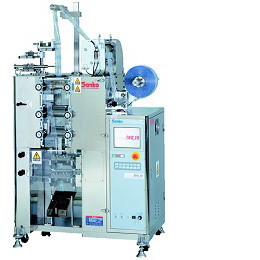 A packaging film shaft forward-backward moving device can can be programmed and changed through the operational panel.The MR-10’s extensive memory can store data for a complete range of operational items including bag length, packaging speed, sealing temperature, cutting position, position of perforation, and position of printing. In total, data for more than 30 items can be stored in the MR-10’s memory. A list of more than 40 options available for the MR-10 includes a perforation device, packaging film shortage warning device, preset number divider, vertical sealing heater, vertical four-side sealing, vertical slitter, air compressor and centralized monitoring system. Also offered are a calendar timer, leakage detector, and several printer options, as well as a variety of pumps including rotary, cascade, hyper and high-speed intermittent (servo-type).